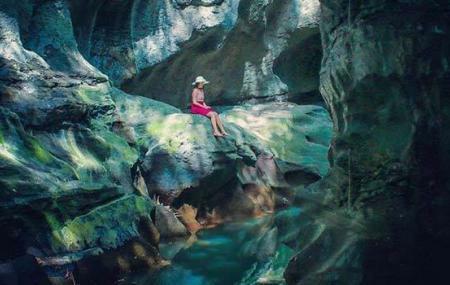 Hidden Canyon Beji Guwang is a natural tourist destination in Bali complete with pools, rocks, and waterfalls. Formed across a section of the Oos River, the rugged and deep gorge of Hidden Canyon Beji Guwang is an interesting place to explore. The trail here follows the river and as you get deep into the terrain, you will spot colorful butterflies that will make your trek even exciting. The hidden gem of the destination should definitely be explored on your visit to Bali and make sure you get wet. How popular is Hidden Canyon Beji Guwang? People normally club together Tegenungan Waterfall Bali and Monkey Forest while planning their visit to Hidden Canyon Beji Guwang. People also prefer to start their day with Hidden Canyon Beji Guwang. Awesome experience, we visited this place in the wet season due to which water level was on the higher side. Which made it even more adventurous and challenging. We really enjoyed it, the guide was very nice, humble and friendly. Must visit if you love adventure. Carry extra clothes as you will get fully wet. Great little half day adventure, great way to cool off and explore at the same time. Price is a little high for essentially a walk through some canyons but that price includes a driver and lunch so cannot complain. If you are a the more extreme adventure type perhaps give this one a miss as it's a easy journey. As others said bring some spare clothes as I'm just under 6 foot and it was up to my chest and that's with not much rainfall in the last week. Prepare your feet because you are going to hike this canyon barefoot with small rock handles and small slippery sides of cliffs. Beautiful and worth the price. Your guide will be there to help you through it all and loves to take pictures. I've heard of this hidden canyon for about 3 years already. Last weekend I decided to go and had an amazing adventure. The guides were quite attentive and helpful. It was more like trekking which took us 2 hours. The view is very beautiful with all the rocks and the way back to the lobby through the rice terraces and veggie gardens. If you like adventure then you have to do it. My favourite is the rope swing.